Hank Azaria and Amanda Peet co-star in "Brockmire," a half-hour comedy series that began years ago as a viral short video on the Funny or Die website. The series centers on the fall of Jim Brockmire, a once-famed major league baseball announcer who suffers an embarrassing on-air meltdown caused by his wife's serial infidelity, leading to a decade away from the booth. 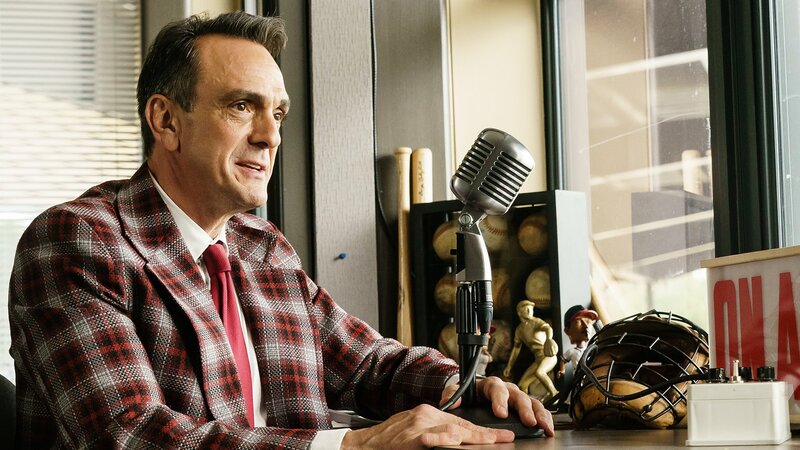 Older and presumably wiser, Brockmire attempts to reclaim his career, reputation and love life by returning behind the mic, but the setting -- a broken-down rust belt town, home of the minor league's Morristown Frackers -- is not quite what he envisioned. Strong-willed, hard-drinking owner Julia James has a complicated relationship with Brockmire, while whiz-kid intern Charles is simultaneously entertained by and terrified of the new announcer. Years after his epic meltdown, sports announcer Jim Brockmire is brought in to call games. Jim and Jules hook up the night before the Frackers win a game. The players hold a mock trial and Jules urges Brockmire to mediate. Brockmire's ex reappears, and forced to confront his emotions, he defaults to drinking. Brockmire attempts fame again; Jules and Charles work to make Brockmire a household name. Brockmire attends an event honoring broadcasters; Charles attempts to impress a girl.